The gastric sleeve, also known as a sleeve gastrectomy is a surgical procedure during which the capacity of the stomach is dramatically decreased in order to aid weight loss. The procedure involves the permanent removal of a large portion of the stomach. This reduces the size of the stomach from the size of a football to the size of banana, which has a capacity to hold only a small portion of food. The procedure involves using keyhole (Laparoscopic) surgery under a general anaesthetic. Your surgeon will remove a large part of your stomach and the remaining portions of your stomach are joined together using surgical staples. This creates a long vertical tube or banana-shaped stomach. As a result of this much smaller stomach, patients feel full after eating much less food. Patients also feel less hungry between meals.If your BMI score is over 35+, and have not been able to lose weight through diet and exercise, surgery may help you to achieve long-term weight loss. Gastric sleeve surgery may also help if you suffer from other weight-related medical conditions such as Type 2 diabetes or high blood pressure. Used In conjunction diet and a modified lifestyle, a gastric sleeve can help patients achieve long-term weight loss, greatly improving their health and wellbeing. ...nine stone lighter and returning for a tummy tuck in 4 weeks. I can't express how professional and friendly all the team here are. I have heard and read so many bad stories about going abroad, you may pay slightly more staying in Ireland but it's so worth it. Went to the Dublin clinic and I cannot fault one staff member. From the girls at the front to the nurses and anesthesiologist at the back and Dr Salman himself, everybody was extremely professional, compassionate and friendly. Follow up care is fantastic and the results speak for themselves. I would highly recommend Auralia." Going for a Gastric Band in Auralia clinic has been the best decision I’ve ever made. They have been looking after me since day one and aftercare is brilliant. Thanks to Auralia I’ve lost over 4.5 stone. Now I’m able to run 10k and numerous half marathons which I was never able to run before. The section of stomach which has been removed is where a hormone called Ghrelin is produced. Ghrelin is also known as the “hunger hormone”, as it makes you feel hungry when released. Removing this part of the stomach dramatically decreases your natural appetite, along with only being able to eat a small portion of food. The surgery is completed via laproscopy (keyhole surgery), meaning that the recovery and healing time is substantially decreased. The gastric sleeve works from day one, requiring very little after-care. Unlike the gastric band, the gastric sleeve doesn’t require follow up appointments for adjustments in the future. The gastric sleeve will result in faster weight loss than a gastric balloon or a gastric band. This is largely dependent on your current weight and your weight loss goal. However, a typical weight loss would be between 6 and 7 stone (38 – 44kg) within the first year. 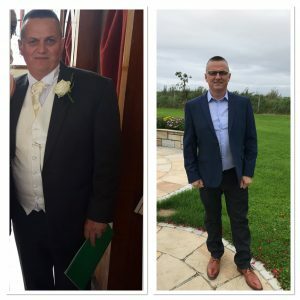 Several patients have lost as much as 11 stone (70kg) within this time. A patient’s weight loss is largely dependent on how much effort they put into the nutritional and exercise program. Generally, the more you interact with the program, the more successful you will be. However, Auralia Weight Loss Clinic has never had a patient who simply hasn’t lost weight on our gastric sleeve program. Whilst every person is different, we would expect our gastric sleeve patients to lose around 6-7 stone within the first 12 months. However, many of our patients have lost as much as 11 stone within this time. This is largely dependent on how compliant the patient is with the after-care program. Yes, you are likely to have some discomfort from two main sources. Firstly the entry sites, through which the operating instruments and camera were passed through, can be sore. Secondly, it is quite common to have left shoulder pain after the procedure. This is actually pain coming from the diaphragm which is the large, thin sheet of muscle separating the chest from the abdominal cavity. It usually settles down after a few days. In general, most do not have severe pain and what discomfort they do have responds to simple painkillers. Generally there is minimal scarring. The incisions are very small, as the procedure is carried out through keyhole surgery. These are sutured and/or glued and will normally heal in 10-14 days. The scars should fade gradually. There should be no vomiting at all. The purpose of the gastric sleeve is to reduce your portion size and appetite. It is NOT meant to stop you eating. If you are vomiting frequently, you are most likely over-eating and you should contact us right away. Because you are eating much less and losing weight, we recommend that you take a soluble multivitamin each day just to make sure you are covering all your requirements, especially B vitamins, folate and iron. The multivitamin which we recommend is Centrum A-Z. Can the gastric sleeve be reversed? No. The gastric sleeve procedure cannot be reversed. Yes. It is usually safe to have other surgical procedures but it is important to let your surgeon know you have had a gastric sleeve in the past. As you eat less the amount of residue (especially fibre) in your diet falls and your bowel activity decreases. Although rare, if you do become constipated, there are plenty of effective remedies to deal with the problem. Your pharmacist will be happy to advise you on the best solution. The gastric sleeve does not interfere in any way with normal pregnancy, of course the likelihood of becoming pregnant is higher as a result of the surgery, since weight loss is known to increase fertility. The main priority during pregnancy is ensuring that you are getting enough nutrients in your diet. Yes – in moderation but you need to exercise caution. Alcohol has a high calorific value (7kcal/gram) and provides a lot of unwanted calories. Technically, yes. However, because you can only eat small amounts, it is quite important to include foods which are rich in protein but low in fat and sugar. We encourage you to eat vegetables, fruit, whole-grains, lean meat and fish. There are no problems with air travel whatsoever, after gastric sleeve surgery. Am I required to attend regular follow up appointments, similar to gastric band patients? No. Whilst your after-care allows you to come for an unlimited number of appointments, the gastric sleeve does not require any “adjustments”, like a gastric band does. Therefore, you can choose when you do and don’t want to come into the clinic. Having said that, we would encourage you to attend the clinic as often as needed. Research shows that patients who attend regularly will generally lose more weight. Will my gastric sleeve require lifetime “maintenance”, similar to the gastric band? No. Whilst the gastric band does require some maintenance through fills and de-fills, over the long term, your gastric sleeve doesn’t. The gastric sleeve is designed to work from day one. There should be no need for any adjustments over the long term.